BionX offer another excellent pedal assist ebike to the electric bike market. Most models use a 200watt motor making it legal in most countries. Various settings on the console can offer more torque for hill climbing or more power designed for speed and flat road use. A torque sensor located on the rear axle automatically detects the force of the rider pedaling and activates the motor, you can select the amount of power you want the motor to give, or just push the button and go. Being pedal assist it is important to realise that you will use the battery very quickly if you just hold the throttle and don’t pedal. The BionX electric bike kits are sold as a complete ebike kit by some big name bike brands such as Orbea, Trek KTM and Raleigh. But can also be purchased separately and retrofitted to nearly any bike. The kit consists of a hub motor, battery, control console and switch. The battery is usually mounted to the down tube or a rack on the back of the bike. The back wheel is usually replaced with the motor and a whole new rim, although it is possible to get your preferred rim fitted to the motor by a bike shop, you could do it your self, although it is a fiddly and difficult job to do without the proper jigs and equipment. The console is mounted to the handle bars with a small switch that can be mounted to use as a thumb operated switch. BionX are one of the few brands that offer regenerative breaking a neat little add-on with not much significant gain. It has been said that to get a further 20 mile range you would need to be constantly breaking for about 200miles. 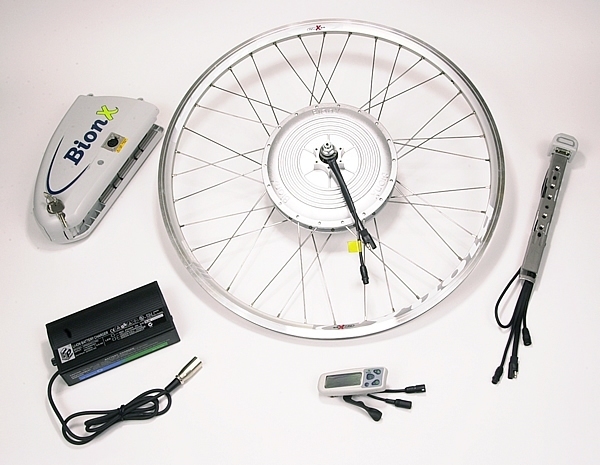 As with most electric bike conversion kits they are more or less maintenance free. Although it is probably wise to regularly check that all components are working properly or not damaged. The battery being a Li-Ion does not suffer memory effect so there is no need to completely discharge it, but it is supposed to be stored fully charged if not using it for several months. As with most modern Lithium batteries they have a low voltage shut off to prevent damage from completely emptying them. One other maintenance task that can help ensure peak performance and a long lasting ebike is doing software updates when the become available. These updates help ensure the motor and battery are running in perfect harmony together, A little like keeping your software up to date on your computer. BionX offer only Li-Ion Batteries with a few different options. The 48V Li-Ion pack offering a range of about 105km (65mi) down to the 26V battery giving about a 65km (40mi) range. As they are pedal assist you will not just be able press the button and get these kinds of ranges, but with a bit of pedaling or just using it on hills it is easy to do many kilometers in a single charge. If you send the kit to Spain. Will fit on a CUBE AMS PRO 100? BionX don’t ship internationally but they do have a growing number of retailers. Do a search with your post code to find one. I have a 750watt/36volt electric bike conversion kit. It has both, throttle and PAS. How do you get and make sure your pedal assist is working correctly?? It has the new lcd screen and 5 setting’s-PAS. Thank you for your help/info.